Exploring the connection between nutrition and mental wellness so therapists can provide more effective, integrated treatment. Where there is mental illness there is frequently a history of digestive and nutritional problems. Digestive problems in turn exacerbate mental distress, all of which can be improved by nutritional changes. It’s not unusual for a deficit or excess of certain nutrients to disguise itself as a mood disorder. Indeed, nutritional deficiencies factor into most mental illness—from anxiety and depression to schizophrenia and PTSD—and dietary changes can work alongside or even replace medications to alleviate symptoms and support mental wellness. 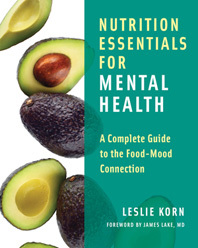 the essentials for integrating nutritional therapies into mental health treatment. Throughout, brief clinical vignettes illustrate commonly encountered obstacles and how to overcome them. • Assessment techniques for evaluating a client’s unique nutritional needs, and counseling methods for the challenging but rewarding process of nutritional change. And much more. With this resource in hand, clinicians can enhance the efficacy of all their methods and be prepared to support clients’ mental health with more effective, integrated treatment.